There's a lot going on in and around Sacramento for active adults to enjoy. California’s capital city has a vibrant downtown, rich culture, and access to top-notch healthcare, not to mention all of the outdoor recreation just a short drive away. The area also enjoys a Mediterranean climate with plenty of sunny days and very mild winters. 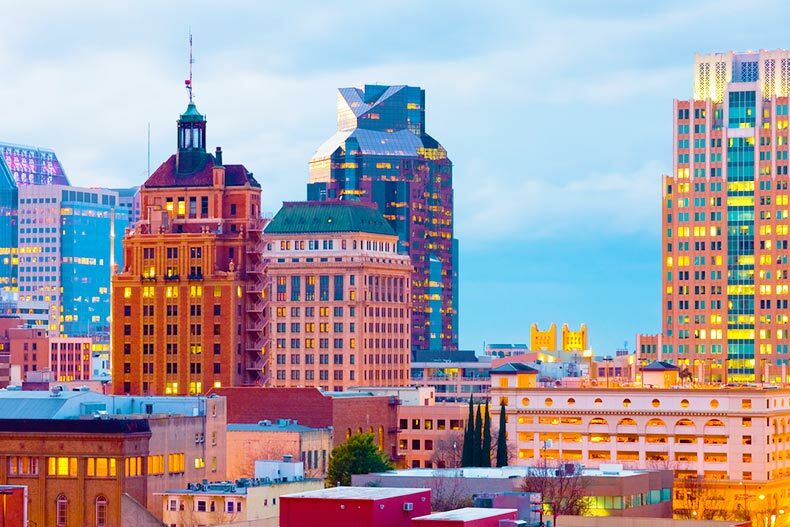 With a cost of living that’s much lower than other California cities, Sacramento is an attractive option for those looking to settle down in the Golden State without paying through the roof. As one of the most diverse cities in the U.S., Sacramento has a lot to offer in terms of arts and culture. The tree-lined streets of the downtown district have plenty of options for dining, shopping, entertainment, and cultural events. Sacramento is also ideally located, making it easy to take weekend trips to Napa, Lake Tahoe, or California’s beautiful coast. Below we’re rounding up some of the top active adult communities that the Sacramento area has to offer. Sun City Lincoln Hills is a large 55+ community located about 30 miles from downtown Sacramento. This sprawling community covers nearly 3,000 acres of beautifully landscaped grounds. Sun City Lincoln Hills has 6,783 homes that are priced between the high $300s to the high $900s. These attached and single-family homes are available in many floor plans and they range in size from 917 to over 3,000 square feet. The community’s 68,000 square-foot recreation center Orchard Creek Lodge makes it easy for residents to stay active and connect with neighbors. It includes an indoor pool, two outdoor pools, an indoor walking track, fitness center, and a large ballroom with a stage. Outdoors, residents can explore the community with 19 hiking and biking trails. There are also two 18-hole golf courses onsite. Suncountry is a wonderful option for those seeking a peaceful, welcoming 55+ community in the heart of Sacramento. This small community has 307 single-family homes that are designed for low-maintenance living. Homes are priced between the low $200s to the low $300s and range in size from 980 to 1,500 square feet. Suncountry’s location is ideal as downtown Sacramento is just a short drive away but the community maintains a tranquil environment. The community provides two clubhouses where residents can meet up and stay active. The main clubhouse has a library, catering kitchen, and billiards, while the second clubhouse has a multi-purpose room that is perfect for catching up with neighbors. Both clubhouses have an outdoor pool to enjoy Northern California’s pleasant weather. There are also tennis courts, walking and biking trails, and a shuffleboard court. Versante is a charming 55+ community nestled in the foothills of the Sierra Nevada Mountains. With 100 attached homes, this community offers a quaint atmosphere. There are four different floor plans available, ranging in size from 1,610 to 2,259 square feet. Prices begin in the high $300s and reach the mid $400s. Versante’s clubhouse is the social center of the community and offers scenic views of the surrounding hills. Residents can stay fit in the exercise room, take a dip in the outdoor pool and spa, or simply enjoy California’s sunshine on the spacious patio. This pet-friendly community also has parks and plenty of walking and biking trails. The community’s convenient location gives residents easy access to eateries, shopping, and entertainment. For active adults looking for a modern 55+ community with new homes, Heritage Vineyard Creek is a great option. Development broke ground in 2017 and the community will eventually have 171 single family homes. These spacious homes range in size from 1,743 to 2,206 square feet and pricing begins in the high $300s and reaches the high $400s. The community provides a resort-like atmosphere with an impressive lineup of amenities. The exclusive clubhouse, called The Resort, has a state-of-the-art fitness center, a double-sided fireplace, outdoor pool and spa, two lighted pickleball courts, a community garden, and more. Like most Sun City communities, Sun City Roseville offers an amenity-rich lifestyle for active adults aged 55+. This large community has 3,110 single family homes that are priced between the low $300s and mid $500s. There are over 20 floor plans available, ranging in size from 878 to over 2,600 square feet. With a full-time activities director, Sun City Roseville makes sure its residents never have a shortage of ways to stay active and social. The Timber Creek Recreation Lodge is a 52,000 square-foot recreation center that is the social hub of the community. Timber Creek Recreation Lodge has a top-notch fitness center, indoor lap pool, grand ballroom with a stage, and more. Residents can pursue their interests with arts and crafts, ceramics, and sewing studios. Sun City Roseville also boasts two beautiful golf courses. Interested in what else is available in the region? Learn more by browsing current listings for communities in the Sacramento area.